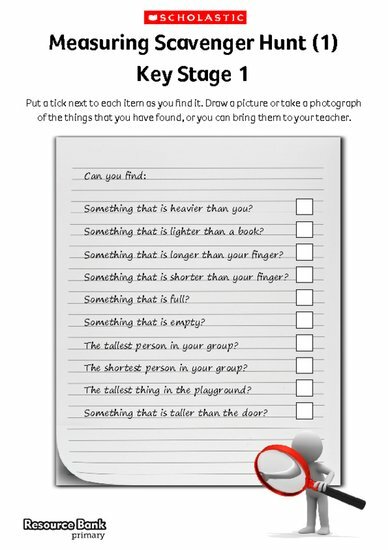 In Year One and Year Two, the scavenger hunts focus on measure, using some of the vocabulary that children are expected to use (for example, longer, shorter, full and empty) and, for Year Two, the standard units of measure. These hunts are a good way to assess children’s understanding of new terms as well as their ability to measure accurately in a range of contexts. It can be useful to place a helper in a central spot of your school grounds so that children can check the meaning of any word they are unsure of. Having cameras that the children can use is also a good way for the children to accurately record what they have found, rather than drawing pictures, as for many of the answers they won’t be able to bring the objects to you!